Welcome to fourth and final instalment of my Brian’s Travel Spot series, which started with my flight out to Hong Kong, continued with my adventures in Hong Kong itself and then moved onto Shanghai, where I was spent a week on business before having the weekend to explore. This instalment covers the final leg of the trip, Chicago, where I spent 10 days staying with friends before flying home, completing my first round-the-world trip in the process. The more observant amongst you will notice that I haven’t actually finished my Hong Kong or Shanghai posts, but I wanted to get this post on the Coffee Spot before I actually completed my travels. It’s been a weird trip for me: because I was working in Shanghai and then staying with friends in Chicago, I’ve had very little spare time, so between keeping the Coffee Spot up-to-date, doing the day job, and socialising with my colleagues (Shanghai) and friends (Chicago), I’ve had very little time to do these Travel Spot posts. As a result, you can expect to see regular updates coming along for all three posts between now and the end of year! 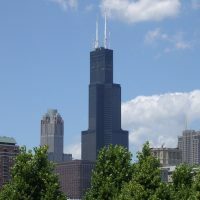 A quick word about Chicago: although I say I was staying in “Chicago”, my friends live in Chicago in the same sense that I live in London (the point being that I actually live in Guildford). With that out of the way, let’s get on with the Travel Spot. You can read about my flight from Shanghai to Chicago after the gallery. When planning this trip, I originally thought I’d have to fly back from Shanghai, spend a couple of days at home, suffering horrible jet-lag, then fly out to Chicago to do the same again. That, I decided, would be no fun. I did briefly think about cancelling the Chicago trip before checking out the obvious: flying from Shanghai to Chicago. I quickly discovered that not only was this possible, it was actually preferable. Although the US carriers wanted close to £1,000 for a one-way flight, a new Chinese airline, Hainan, was offering an option of flying via Beijing for under £400. What’s more, if I went from Shanghai to Chicago, then on to the UK, I’d have flown around the world in the process, something I’ve always fancied, but never before had the opportunity to do. As an added bonus, it turned out to be significantly cheaper to fly all the way around the world than to go out to Shanghai and back, then to go out to Chicago and back. Who’d have thought it? In a fit of enthusiasm, I booked an 8.40 flight out of Shanghai, which gave me a three-hour layover in Beijing, followed by a 12-hour flight to Chicago. Although this meant getting up at stupid o’clock (left to my own devices, I try not to be up by 8.40, let alone be on a plane by that time), it was vastly preferable to the alternative flight, which involved an overnight layover in Beijing. Nevertheless, I was deeply unimpressed when my alarm went off at 5.15 on Monday morning. I was even less impressed to find that the torrential rain that had come in the night before was still falling, although by the time I dragged myself out of the hotel 20 minutes later, I was pleased to see that it had stopped. Shanghai did love me after all. Although I greatly admire Shanghai’s metro system, it is, like Hong Kong’s, relentlessly busy. Except at six o’clock in the morning, I discovered, when I caught the second train of the day out towards Hongqiao Airport. Amusingly, this line actually splits in two a couple of stations before the end, one branch going to the airport and the Hongqiao railway station, the other going elsewhere. Naturally, my train was on the other branch, so I changed for the final couple of stops. The second train of the morning had been blissfully empty, and I had the carriage almost to myself, an unheard of luxury. By the time the third train of the morning rolled in, this one going to the airport, normal service had been resumed and it was standing room only. I guess there are some advantages to getting up at 5.15 after all! You can find out what I made of Hongqiao Airport after the gallery. I hadn’t really seen much of Hongqiao on my way in, walking straight out of the terminal and into the metro. This time I got more of a look and, I have to say, I approve. Like Hong Kong before it, it’s a large, modern, spacious airport. Originally it had been Shanghai’s main airport until the new Pudong Airport opened southeast of the city. With Pudong handling all of the international flights, Hongqiao switched to domestic flights and was rebuilt in the process (much in the same way that the Heathrow terminals have been systematically rebuilt in the wake of Terminal 5 opening). The result is a very pleasant airport environment, which the Chinese penchant for security did its best to ruin. First we had our bags screened before check-in, then we had them screened again at check-in, then there were the normal security checks, all of which required the favourite airport activity, queuing. I’d already been warned about Shanghai airport security from fellow blogger and champion flat-white inhaler, Rebecca (aka Runaway Kiwi) who had had problems a month or so before me. She’d had her prized nail varnish pulled from her checked luggage and confiscated as a fire risk! Although Rebecca had flown from Pudong, I was expecting similar levels of security at Hongqiao, so had left my nail varnish at home. What I hadn’t accounted for was similar levels of scrutiny of anything metal in my checked luggage. Given that my coffee kit usually gives the security people fits when I take it in my hand-baggage, I’ve taken to packing as much of it as possible in my checked luggage, along with any spare chargers, etc. No sooner had I checked my bag in than I was told to go to a room at the side of the check-in area, where I found my rucksack and a (very polite) security man waiting for me. Bizarrely, given what else was in there, he wanted to have a look at the charger for my camera battery, and (you’ll never guess) my cuff-links. Fortunately I avoided the Runaway Kiwi fate and nothing was confiscated. My bag safely repacked, I then had to go back to the check-in desk to get my boarding pass before I was allowed on my way. After that, it was relatively plain-sailing, although we did have to queue up for another ID check before we went through security. This turned out to be the longest queue in the whole process, although it had the benefit of reducing the queue for the x-ray machine to zero. Ironically, given the trouble that my checked bag had caused, no-one batted an eyelid at the various chargers and metal cylinders (including my Espro Travel Press and my trusty, bright-red feldfarb grinder from Knock) in my hand-baggage. This was my first time flying with Hainan Airlines and if this is representative of all of its flights, I have no hesitation in recommending Hainan. However, before that, there was the small matter of coffee, since I’d not yet had any, a very poor state of affairs. The day before, I’d been presented with a gift from Blue King, a freshly-roasted sachet of Monsoon coffee from India, so I did my usual trick of asking nicely at the Costa Coffee at the airport (yes, they are everywhere) and picking up a jug of hot water for my pains. This was the first time I’d come across one of these individual filter sachets and I wasn’t sure how to use it. In the end, I dunked it, tea-bag style, in my Upper Cup. I got a fairly decent cup of coffee as a result, but I can’t help feeling that I didn’t really do it justice. With hindsight, I should have just ripped open the bag, popped the ground coffee in the Travel Press, and made it that way. Oh well, you live and learn. The first part of the flight, the hop over to Beijing, was excellent (I say “hop”, it was 2½ hours, roughly the same as my flight from Hong Kong to Shanghai). Hainan, being a new airline, has pretty much a brand new fleet and we were on a very modern 737-800. Even though the flight was packed, the service was very good and with breakfast inside me, I was all set for Beijing. I’d heard bad things about transferring through Beijing, but that was from a colleague coming into Shanghai. Going the other way, I experienced no great problems, just the usual airline drill of queue, wait, queue some more. I arrived in Terminal 1 and, with my flight to Chicago departing from Terminal 2, I had to collect my bag and take it over. This was a long enough walk as it was, but just to give me some additional exercise, Terminal 2 is split into domestic and international departures, with (you guessed it) international departures at the very far end of what turned out to be a very long terminal. International departures was like an airport within an airport, with a separate queue to get in, where you had to show your ticket. There was another bag screening, except there were far too many of us waiting, so the security guards just let us through. Although I didn’t mind, it does make me wonder what the point of it was in the first place. From there, it was the usual check-in queues (although the line for the Chicago flight was significantly shorter than all the others), the queue for passport control (the longest of them all) and the security queue. After all my excitement at Shanghai, I’d moved the offending items from my checked bags to my hand-baggage, breezing through security as a result. Once I got to the gate, it was all very relaxed. There are comparatively few international flights out of Beijing (imagine Heathrow if flights to Europe were classed as domestic and all the remaining flights had a terminal of their own) so the gates were very quiet. I found somewhere serving a vegetarian sandwich (the first time at Hong Kong, Shanghai or Beijing airports), so felt obliged to buy one. Fortunately this used up my remaining Chinese money, right down to the last Yuan. Then I came across what might be the greatest innovation in airport history after (working) free Wifi (the free Wifi in the international terminal didn’t work by the way, delaying the appearance of that Monday’s Coffee Spot, Sumerian Coffee, by twelve hours). I speak, of course, of the hot water dispenser. All across the terminal, next to the water fountains, there were hot water dispensers, with variable temperature, all the way up to 100⁰C. Some of the other passengers were using these to make tea, although the majority seemed to be heating up the Chinese equivalent of Pot Noodle. I, however, had a much nobler purpose in mind, grinding up the last of my Himalayan coffee with my feldfarb grinder from Knock and making up a Travel Press for the flight. I was, at the time, a very happy man. Unfortunately, Beijing Airport had one more sting in the tail which you can read about after the gallery. When boarding planes, I have my own strategy which seems to be at odds with almost everyone else. I’ll sit at the gate when the flight is called and watch everyone else queue up. If it’s a busy flight, these can be very long queues indeed. So there they stand, shuffling forwards, all so they can get on the long metal cylinder, the same one that they’ll be on for hours on end, about 20 minutes ahead of me. While they do this, I remain in my seat, doing something useful (although in this particular case I was doing something futile: trying to get the free airport Wifi to work). Then, when the queue has died down, and hardly anyone remains at the gate, I pack my stuff up and get on the plane. In this instance, this strategy somewhat back-fired on me. No sooner had my boarding pass been checked than I was faced with a line of four very polite Chinese security guards who were checking everyone’s bags. They were there to enforce a very stupid rule: no-one was allowed to take any liquid on board the flight. Annoyingly they were very thorough in their search and found my Travel Press. After this, the flight was uneventful, although it too had its strange security rules, which banned the use of hand-held portable electronic devices. Normally you can use your mobile phone throughout the flight, as long as it’s in flight-safe mode. Not, however, on this flight, when your mobile phone had to be switched off the entire time. Bizarre. That minor inconvenience aside, the flight was excellent and the service very good. As I’ve said, Hainan is a new airline with a modern fleet, so I found myself on a very well-equipped Boeing 787, with my customary exit row seat. As I’ve noted before, at-seat power has really changed the way I fly, no more so than during the 12 hours I was en-route from Beijing to Chicago. With my laptop out and no distractions whatsoever, I got loads done. Before we took off, I had romantic notions of flying over the Pacific Ocean, but of course, that’s not the way flights work. Instead, we pretty much flew up the coast of China and Russian, crossed the International Date Line somewhere over the Barents Straight, then made our way down Alaska and across Canada to Chicago, arriving 20 minutes before we’d taken off. And with that, I’ll leave things for now. Don’t forget to check back to see what I got up to in Chicago.